Reduced post processing is music to the ears of manufacturers because post processing operations can add a significant amount to part cost and handling logistics for mechanically delicate parts. Furthermore, post processing also means manufacturers have to deal with chemical-based processes and the safety and disposal issues they bring along with them. In the past, the “fly in the ointment” had always been the ROI justification for making an investment in fs lasers, which are considerably more expensive than microsecond fiber lasers or pulsed Nd:YAG lasers. 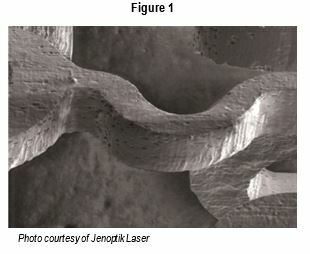 However, if you look at the cutting time per part and the post processing required, the ROI justification for the disk femtosecond laser may be less than 12 months – making it well worth the investment, especially for higher value parts and those that are difficult to post process, for example nitinol stents and hypo tubes. Let me show you the numbers. Figure 2 shows an ROI calculation for a femtosecond laser process used to cut nitinol stents. 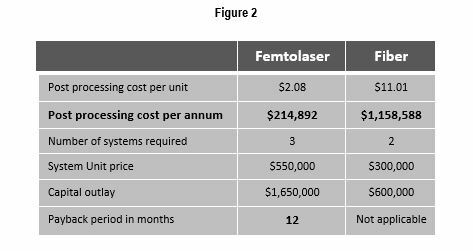 Note how post processing costs plunged from $11.01 per unit with a fiber laser to a mere $2.08 per unit with the femto laser. This reduces the annual post processing costs from more than a million dollars a year to just over $200,000. Even with a capital outlay of nearly three times the fiber laser, the femto laser’s payback period is a mere 12 months – well worth considering.